One of the most important features in any DAW is the ability to automate. In most DAWs, Studio One included, nearly every aspect of the program can be automated: channel volume, pan, mute, plug-in parameters, and virtual instrument (VI) parameters. However, the model used for automation varies from DAW to DAW, depending on how it is structured. Pretty much every DAW I've encountered allows generation and editing of automation data using the breakpoint curve (sometimes called 'rubber band') model, in which automation points are created along the timeline on tracks. In Studio One, breakpoint automation curves are called 'envelopes'. However, track structure varies a bit between DAWs, creating some differences in where automation data resides. Studio One's track structure does not incorporate a one-to-one relationship between tracks in its Arrange view and channels in its Mix view. This leads to an automation model that is perhaps not as completely obvious as in situations where a direct, one-to-one correlation does exist, but one that is nevertheless pretty easy to grasp and quite flexible. To keep things clear as we go along, I'll review the types of tracks and channels in Studio One, and describe how automation fits into the picture. Studio One has four types of tracks: Audio, Instrument, Folder, and Automation. Automation tracks must be where automation resides, right? Well, it certainly can live there, but automation can reside on any of the four track types. So what difference does track type make? Let's take a look at the types one at a time. 1. 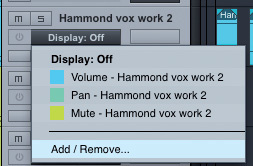 Envelopes are available by default on each Audio track for the basic mixer parameters of the corresponding Audio channel: volume, pan and mute. Press A. This sets all tracks in the Song to display automation data, instead of Events and Parts. Select an Audio track. In the track header, beneath the track name, will be a field that says 'Display: Off'. This is the Automation Parameter field, and the current label means there is no active automation on the track. (If you don't see this field, grow the track's vertical size, or simply select 'Medium' from the vertical track-size drop-down menu at the bottom of the Arrange view.) Click on the field and a menu will drop down showing envelopes for the basic mixer parameters for the corresponding Audio channel: volume, pan and mute. Select one of these parameters and an envelope for it appears. 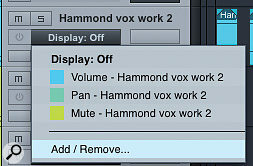 Now select an effect and drop it on the track, or its channel in the mixer. The effect will be instantiated as an insert effect. Click on the Automation Parameter field again and choose Add/Remove from the bottom of the drop-down menu. Picture 2 shows the Automation Add/Remove dialogue box that opens. (There are even faster ways to add an automation envelope, but, for our purposes, this method offers clarity.) Note that only parameters for the current track are available in the right-hand pane, so only they can be added to this track. Open the Inserts folder now visible in the right pane, choose an effect parameter, click the Add button, and close the dialogue box. A new envelope is added to the track and that parameter can now be automated. 2. 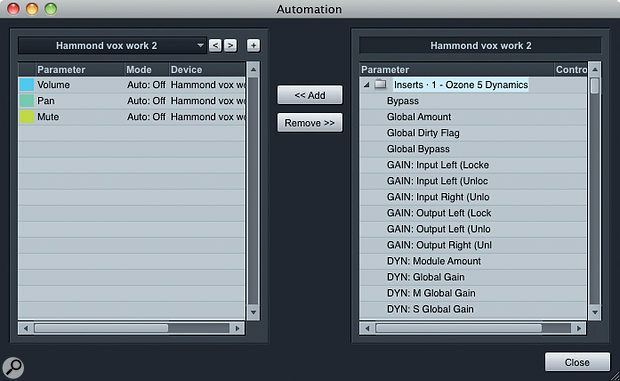 Automation envelopes can be added to a track using the Automation Add/Remove dialogue. When an Audio channel has an insert effect instantiated, automatable parameters for the effect appear inside an Inserts folder in the right-hand pane of the dialogue box. Click on the Automation Parameter field. The first thing you'll notice is that there are no default envelopes. That's because this track is primarily aimed at automating instrument parameters, rather than mixer parameters. Choose Add/Remove to invoke the Automation Add/Remove dialogue box for the Instrument track. In this example, I am using the PreSonus Presence instrument that comes bundled with Studio One. 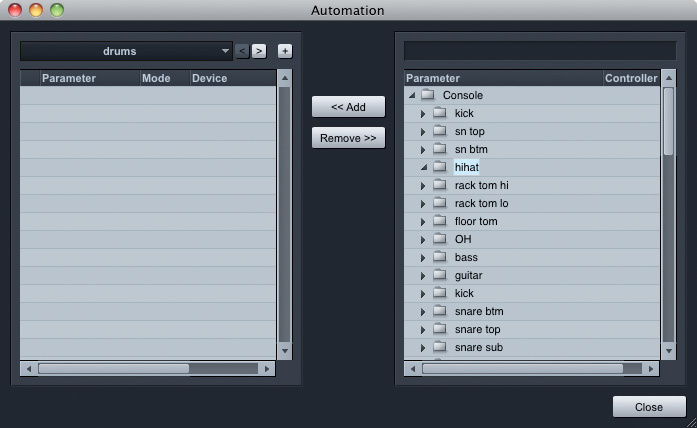 The folders in the right-hand pane contain all automatable parameters for the instrument. Two folders are different to the rest: the Audio folder, which contains Volume, Pan, and Mute mixer parameters for the Instrument channel through which the instrument's audio is being returned; and the MIDI Controller folder, which enables automation using standard MIDI continuous controllers. These might be recorded in real time from a keyboard or other controller. If you drop an effect on the track, the effect will be instantiated on the return channel, and its parameters will show up in an Inserts folder inside the Audio folder. No default parameters appear in the Automation Parameter drop-down of a Folder track, but open the Automation Add/Remove dialogue for the track and there are folders for every darned thing in the entire Song. Oddly, though, if click on most of the folders nothing drops down. So what gives? Basically, the envelopes available for automation on a Folder track are the envelopes that have not already been used elsewhere. Since volume, pan, and mute for every Audio channel exists on the corresponding tracks by default, you won't find them here, but if there are insert effects on those channels that have not yet been automated, parameters for those effects are available on the Folder track. 3. There's much less than meets the eye here. This Automation Add/Remove box opened from a Folder track appears to show folder after folder of parameters, but most of the folders are empty because they are already used elsewhere. This brings us to a key aspect of the track/channel dichotomy, before which we will take a quick detour to talk about channel types. In Studio One, there are Input, Output, Audio, Instrument, Bus and Effects channels. As we have established, Audio and Instrument channels correspond to tracks in some fashion, providing clear locations for automating them, but there are no tracks corresponding to Input, Output, Bus and Effects channels. Automation for any of these channel types can only be performed on Folder or Automation tracks. You won't often automate Input channels. The only thing you can automate on Input channels is insert effects, which are printed as the input signal is recorded. While you may sometimes choose to record with effects, and you might conceivably choose to automate those effects as you record, it is not something you are likely to do regularly. You may have a few more reasons to automate Output channels, and you'll have plenty of applications for automating Bus and Effects channels. In fact, Folder tracks and Automation tracks are the same in their automation capabilities, so Input, Output, Bus, and Effects channels can be automated on either kind of track. From an automation standpoint, the only difference between Folder and Automation tracks is how you prefer to organise your automation envelopes. While the most obvious benefit of a Folder track is that it hides and shows all of the tracks it contains, there is another important feature, which is the ability to assign a Folder track to a Bus channel. All tracks contained in the Folder track then use this channel as a submix. So all my drum tracks are packed in a 'drums' Folder track, which is then routed to a 'drum sub' Bus channel to create my drum submix. Having done that, I create all automation for the submix channel on the Folder track, which proves a tidy, intuitive method of keeping submix automation close to all of the drum track automation. What use does that leave for Automation tracks? You might use an Automation track to automate one or more Effects channels, or a Bus channel that is not acting as a submix. Automation tracks are the most logical choice for those crazy Input and Output channel automation applications, too. In practice, I rarely have need for Automation tracks. 4. Part automation is different to Track automation. It resides in the Music Editor, and the automation travels with the Part. That leaves only one more automation component to talk about. Part automation, like Instrument track automation, enables automating of instruments. But Part automation differs from Instrument track automation in a few important ways. First, Part automation is created in lanes that appear below the note display in the Music (piano-roll) Editor, rather than in an Arrange view track. Second, only parameters of the instrument itself can be automated with Part automation, not parameters of the instrument channels in the mixer. Third, and very importantly, Part automation is local to the Part; that is, when you move the Part, the automation travels with it. There are a few details about Studio One's automation scheme that you need to keep straight, but in practice I end up automating Audio channels on the corresponding Audio tracks, instruments and their channels in the mixer on Instrument tracks, and submixes on corresponding Folder tracks, which is hardly complicated. You have to draw the line somewhere on complexity!